The Colorado Department of Transportation turns its attention to Denver's other interstate now that a wider I-70 through minority neighborhoods is en route. The Colorado Department of Transportation has broken ground on a $2.2 billion expansion of I-70 that’s taken people’s homes and businesses while promising to shove more cars and pollution through north Denver. Now state transportation officials are setting their sights on widening I-25 in the short-term while seeking ways to curb highway congestion in the long term. Governor John Hickenlooper’s roads department has plans — but not funding — to add a continuous “auxiliary” lane in each direction along I-25 between Alameda Avenue and 6th Avenue. (Auxiliary lanes are the ones between highway exits and entrances.) They’re part of a larger widening project, which is mostly complete, approved in 2007. The short of it: Decision-makers continue to prioritize driving as the city grows, while sustainable transportation options lag far behind. There’s more. While CDOT readies to widen I-25 in the near future, officials have their sights set on creating “options to improve travel time and reliability in this highly-congested corridor.” Specifically, the six-mile stretch between Santa Fe Drive and 20th Street in the heart of the city, according to CDOT’s website. Creating better pedestrian and bicyclist crossings over the highway are part of this study, too. This initiative, dubbed the I-25 Central Planning and Environmental Linkages Study, is in its infancy. The roads department has held just one public meeting so far for what is essentially a 20-year vision. But the I-70 widening through low-income, minority neighborhoods began with a similar process. So you have to wonder what’s in store. Tim Lopez, a rep from the Baker Historic Neighborhood Association, does. Lopez wants to involve way more people, way earlier, in whatever happens on I-25, he said. Consultants, city and state transportation officials, and neighborhood reps attended the study’s first meeting, according to sign-in sheets. CDOT has heeded Lopez’s suggestion to reach farther and wider into neighborhoods that will be affected by whatever officials ultimately decide. The last time CDOT widened I-25, congestion came back after four years, because that’s how induced demand works — you make more room for cars, and more cars come. Moving more people in less space via bus lanes, or congestion pricing to ease traffic in the city, would make more sense than attracting more cars with a widening. 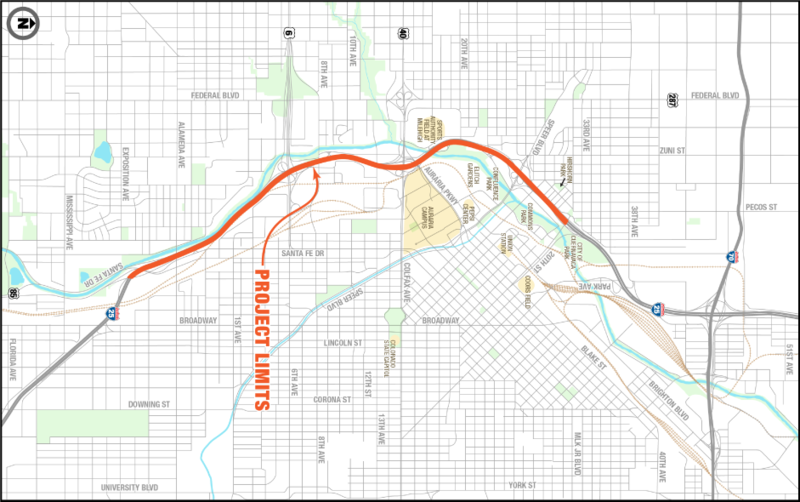 A wider I-25 is technically no guarantee. The I-25 Central study is to come up with several options and eventually rule most out, according to Tamara Rollison, a CDOT spokesperson. Lately these processes have resulted, eventually, with more lanes for cars. On I-70, yes, but also on I-25 south of the city, where Rollison said the option for light rail was nixed early on. After this study, the next step would be an environmental assessment, Rollison said. haha, you make assumptions about the outcomes of studies worse that CDOT does. Not a doubt in my mind that they’re all familiar with freeways in Phoenix where closer to the busy urban core an auxiliary lane runs between exits. Not having to value-engineer your road construction means when freeways were expanded, all exits have nice long merging and exit lanes. Does it make things safer? Much safer! That would require tolling presumably and Arizonans don’t like that idea believing it to be double taxation. With respect to Denver vehicle registrations keep going up so your idea, at least in the near term, sounds like wishful thinking. Another reason to vote no on 109 and 110. The ballot measure would also fund projects like Colfax Avenue bus rapid transit and pedestrian improvements on Federal Boulevard. These projects are scheduled to be done soon. While Prop 110 may fund the I-25 planning it won’t fund the construction. I would rather pass a local tax for Denver projects such as colfax and federal rather than send billions to CDOT to widen highways and encourage sprawl. Fair point. In fact Denver did that in November passing ~$450 million bonding for transportation improvements, including $20 million for Colfax BRT, but the money originally designated for Federal was switched to W. Colfax and Morrison Rd by the two DCC reps from the area. Btw, the $20 million for Colfax BRT leaves the city short by $150 million. Bird in the Hand, my friend, Bird in the Hand. They cant pay for what they have, people won’t give then more revenue….but its build build build!!!! Wtf. This is lunacy. Want to privatize a lane? Fine. There are many to choose from. Already a full half of the cash we gave you is going to a pointless ditch that will continue to kill and maim adults and children forever. But hey, they are black and brown so it don’t matter as long as the white commuters get through . Don’t think the gentrifying areas adjacent to I-70 are reserved for brown and black people. Where are you getting your demographic data?